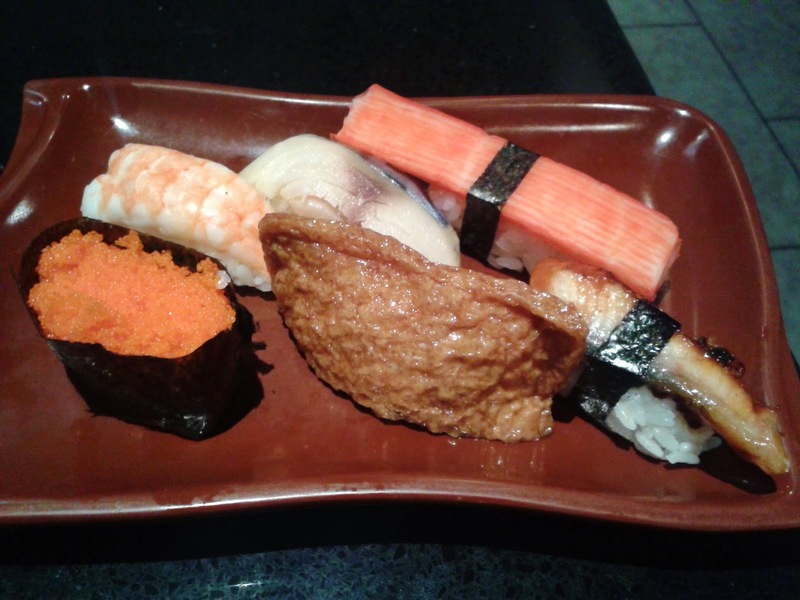 On a dreary, rainy day, I dragged my soggy self to Bene Sushi, a large Japanese restaurant in the heart of West Vancouver with a seating capacity of around 100 people. A clean, elegant ambience greeted me upon my entrance and I was seated approximately right in the center of the restaurant. Sometimes, you don't notice where the sushi bar is due to the enormity of the restaurant. I arrived just in time for the lunch specials before they ended, and I would highly recommend them due to the significant cost savings. I got the Lunch Plate D, which allowed me to order a salad, gyoza, the Bene Roll (half order), the Las Vegas Roll (half order), the Chicken Teriyaki (half order) and 4 pieces of sashimi. 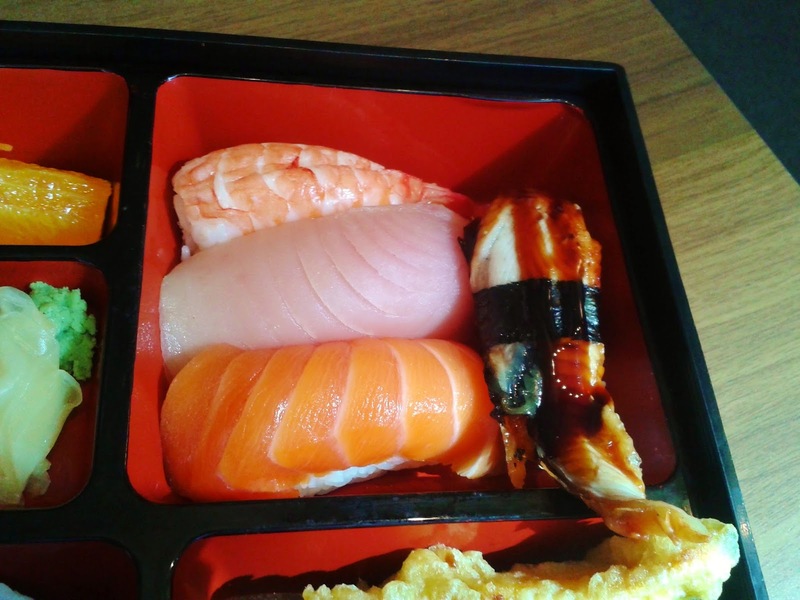 I was apparently starving, and felt the urge to order some nigiri in addition to the Lunch Plate D to top up my meal. The restaurant was mostly empty because I came at just after 2 p.m., so the food came out in a timely manner, with the salad arriving in under 10 minutes. Considering that this salad was part of a lunch combo, the salad was very large. 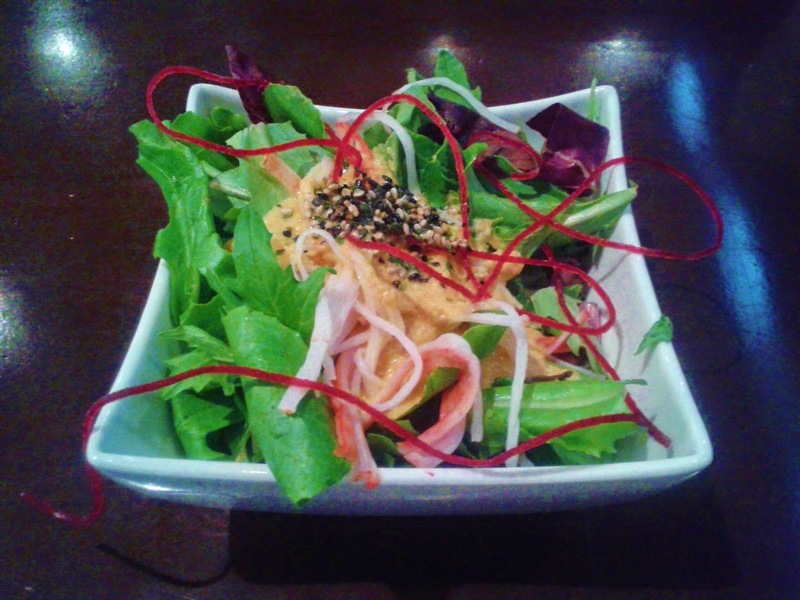 In addition to the arugula leaves and laces of radish, there was also crab meat included in the salad. The crab meat went very well with the Japanese salad dressing, a cool, refreshing vinaigrette with an apple-like flavour. I liked how there was just the right amount of dressing to add flavour to the whole bowl of salad. 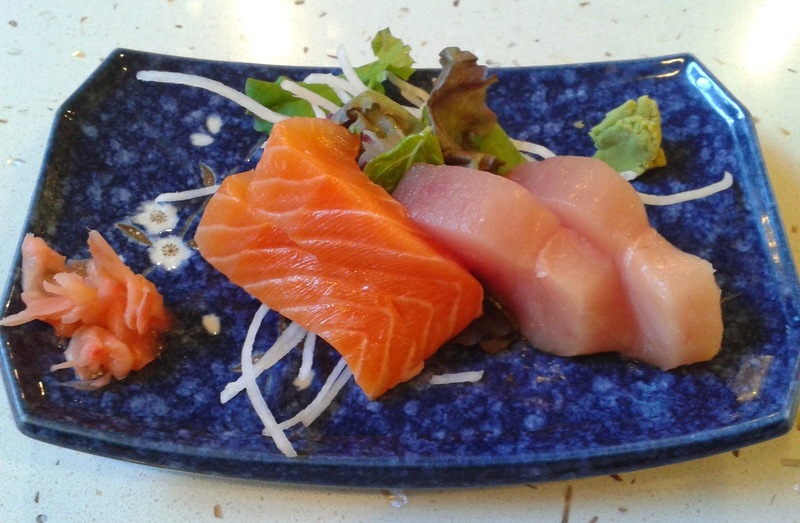 The Salmon Sashimi was rather soft and fatty and had little to offer in terms of flavour. 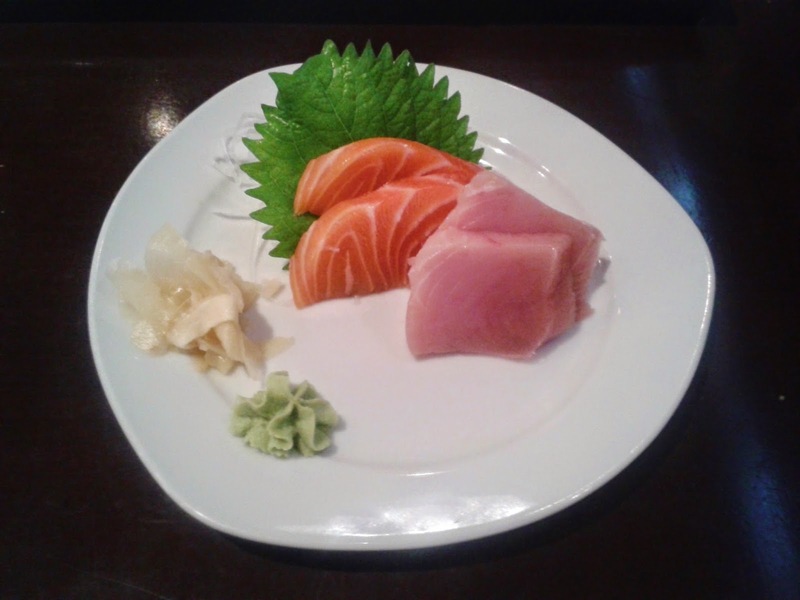 However, the Tuna Sashimi was excellent and tasted very fresh while being not too salty. It held together well and had that desirable melty texture. It couldn't really get any better. 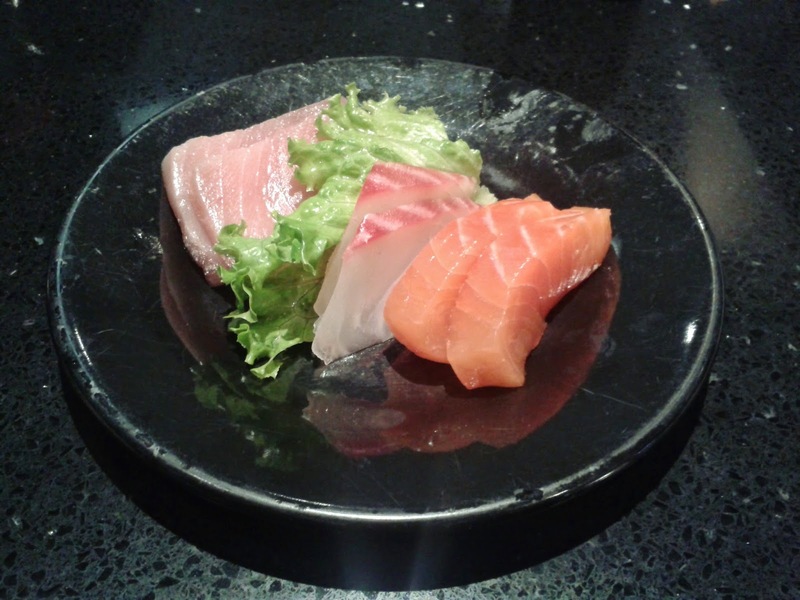 Unfortunately, the pieces of sashimi were on the smaller side. The half order of Chicken Teriyaki came with an adorable ice-cream scoop-sized ball of rice. The chicken was tender and tasted like it was fresh out of the barbecue grill. 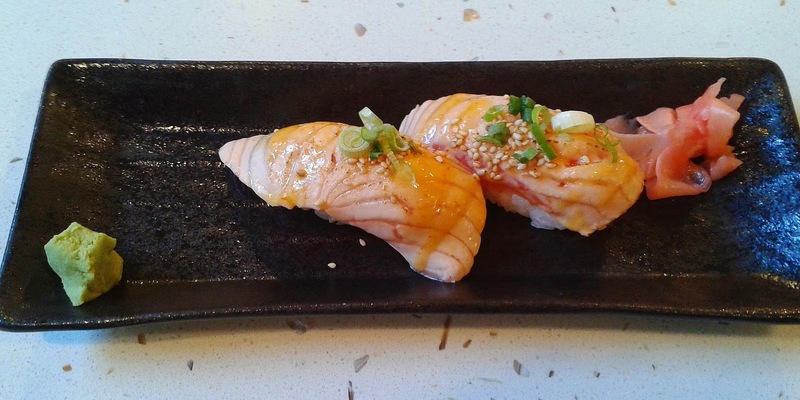 The aroma was strikingly similar to that of Miku's signature Aburi sushi. Overall, it was a delight to taste and smell. 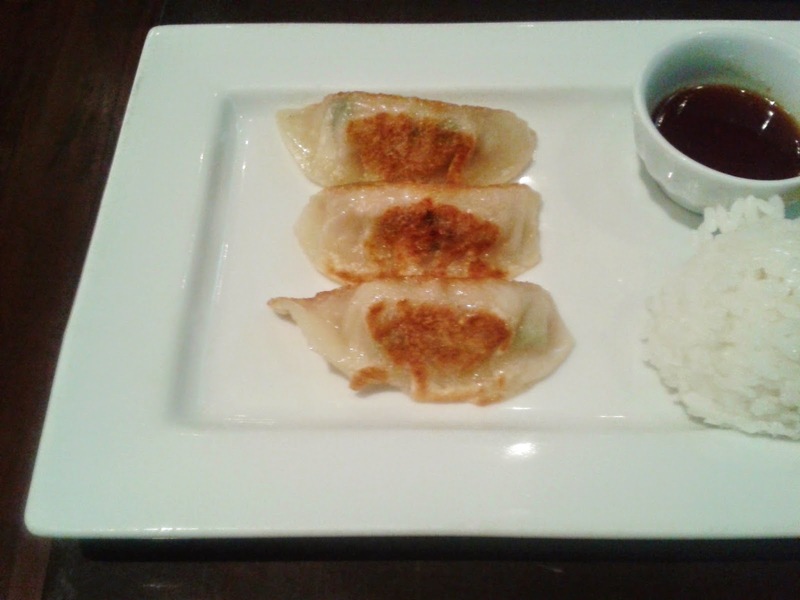 On the other side of the plate sat three neatly aligned gyoza. They had a slightly crispy exterior with a soft interior made with finely ground pork, lettuce, carrot and vermicelli. The vermicelli gave the gyoza a bit of a unique edge. The gyoza had a mild taste overall but by no means bland, and for more of a zing, a dipping sauce was provided (right above the rice). 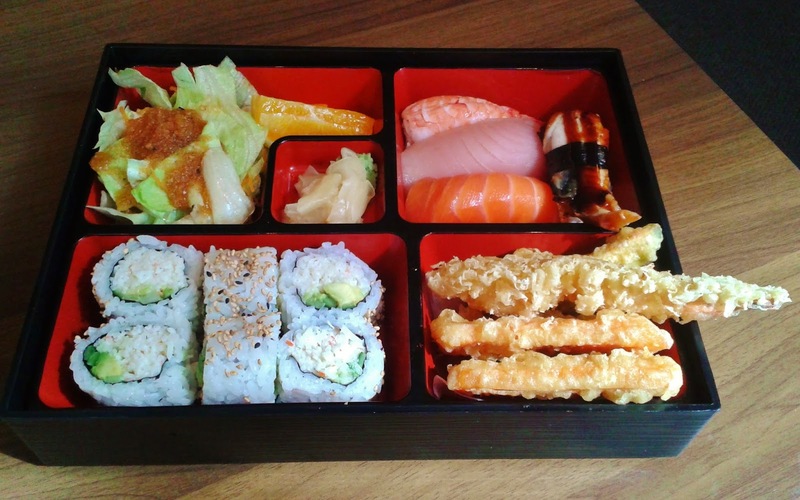 The Bene roll (half order) consisted of prawn tempura, crab meat and spicy braised tuna. I found the spicy sauce to be a little too sweet and intrusive. 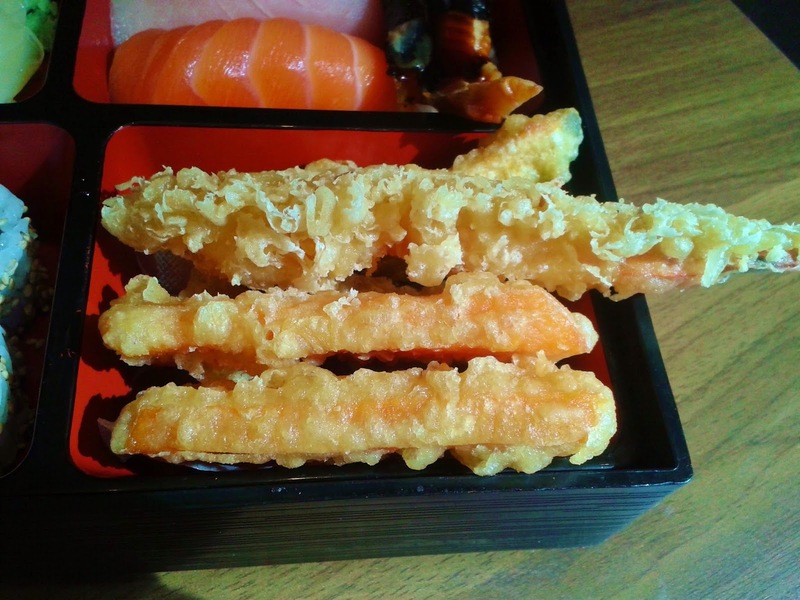 I liked the soft, flaky crab meat, but the prawn tempura could be more prominent. The neat presentation was a plus. 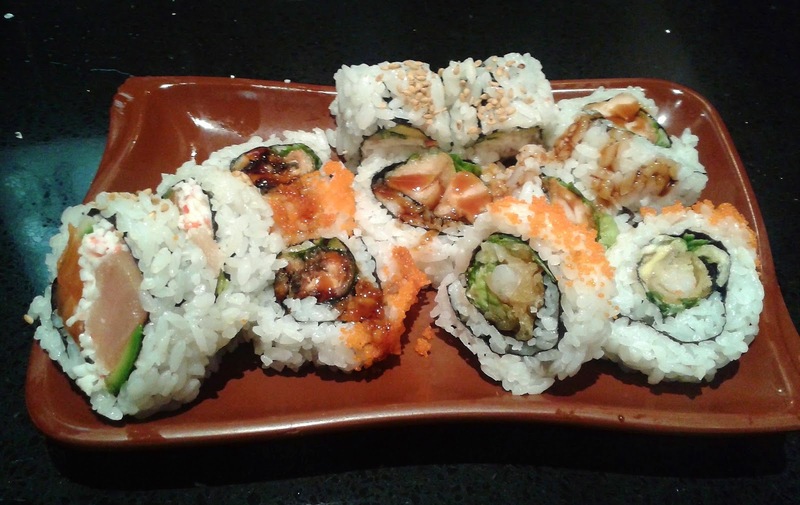 The Las Vegas Roll (half order) consisted of cream cheese, avocado, crab meat, assorted fish and special sauce. The cream cheese was very soft and blended together perfectly with the other ingredients. The crab meat was enhanced by a sweet, cheesy sauce and the light, crispy layer on the exterior was well integrated with the rest of the roll. Since the Chicken Teriyaki was quite well-executed, I decided to test out their ability to successfully deliver seared nigiri. 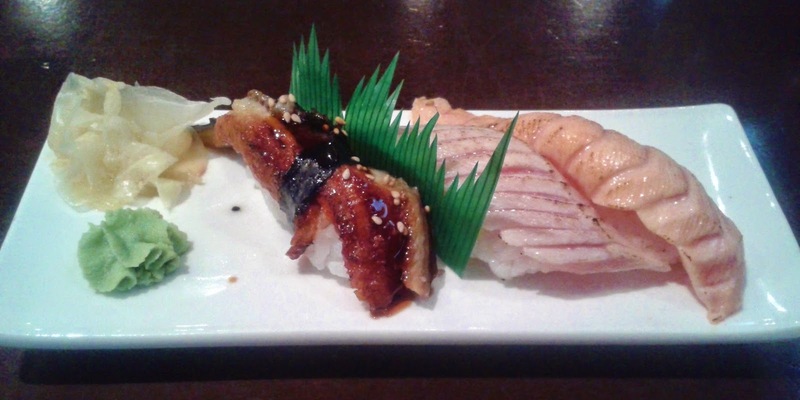 The Unagi Nigiri was freshly grilled and had a warm, savoury taste. The Seared Toro Nigiri had a soft, juicy layer underneath the thin, cooked layer on top. Adding a little dressing would enhance the taste of the toro further. The Seared Salmon, had a nice, marbly texture on the bottom and like the Salmon Sashimi, it desperately needed more flavour. The service was attentive and well-mannered throughout the course of my meal. 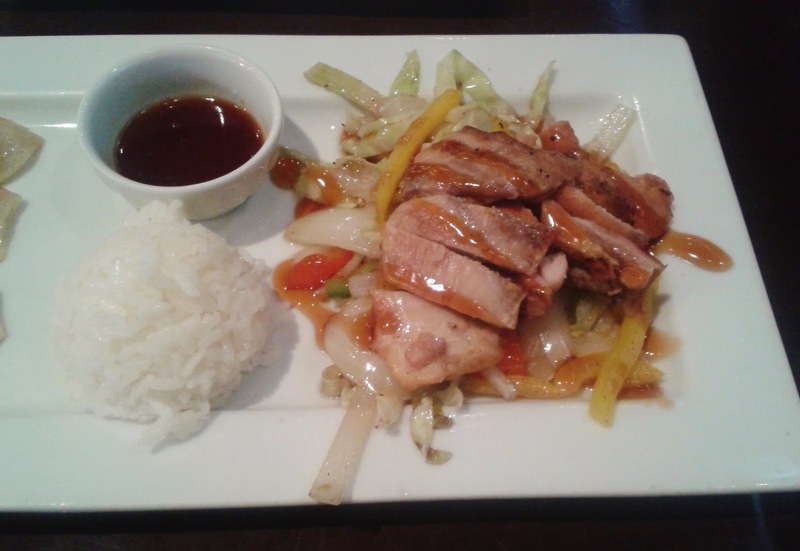 Most of the food was very well-prepared and worth the price premium. 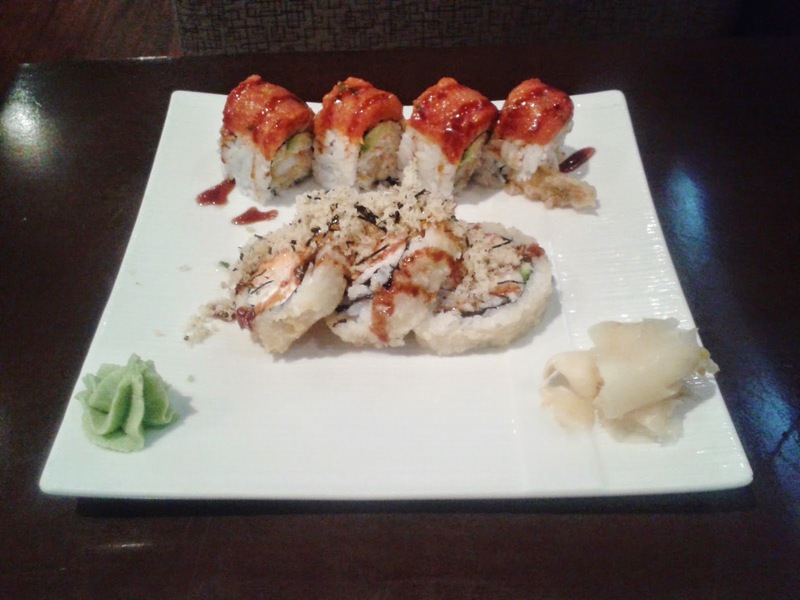 They just needed tastier salmon and a little more experimentation with some of the sauces on the special rolls. Sometimes, I wonder if they ever manage to fill up all those tables. 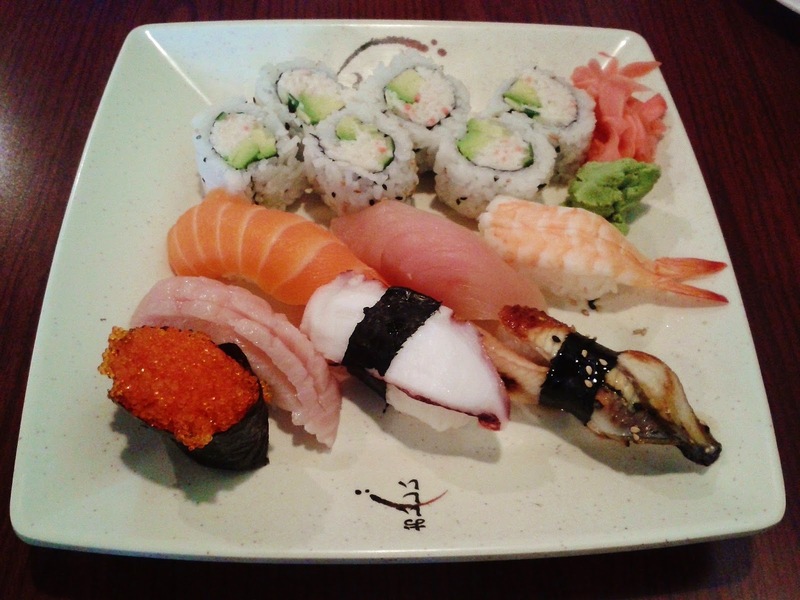 As a way to combat the heat, I did a third "Sushi-a-thon" at Osaka Sushi, a small, Chinese-owned Japanese restaurant situated on Hastings a little to the west of all the busy action around Anton's Pasta. Before my sushi adventures took me all around town, I would come here frequently after my classes to grab a bite before heading home. Osaka Sushi did a decent job of satisfying my craze for special rolls back then when I needed an escape from having the Double Dragon Roll and the Awesome Roll at Sushi Town over and over again. 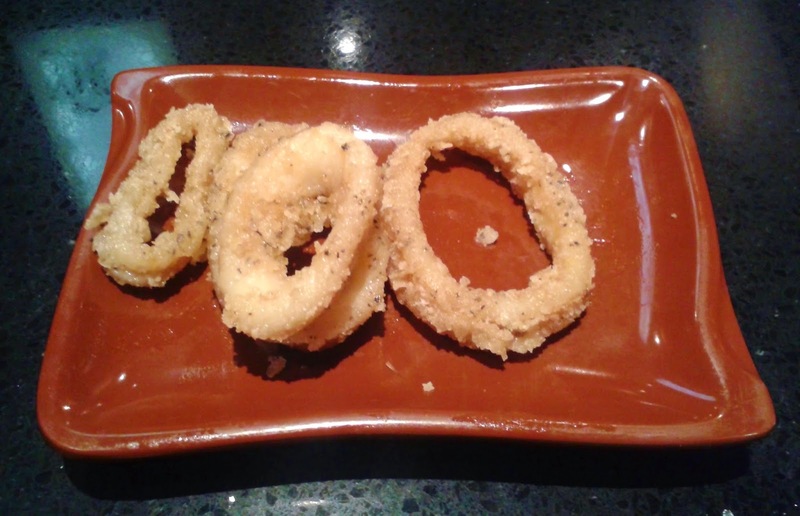 For a small restaurant, they have an impressive number of items on the menu, most of which are very affordable. 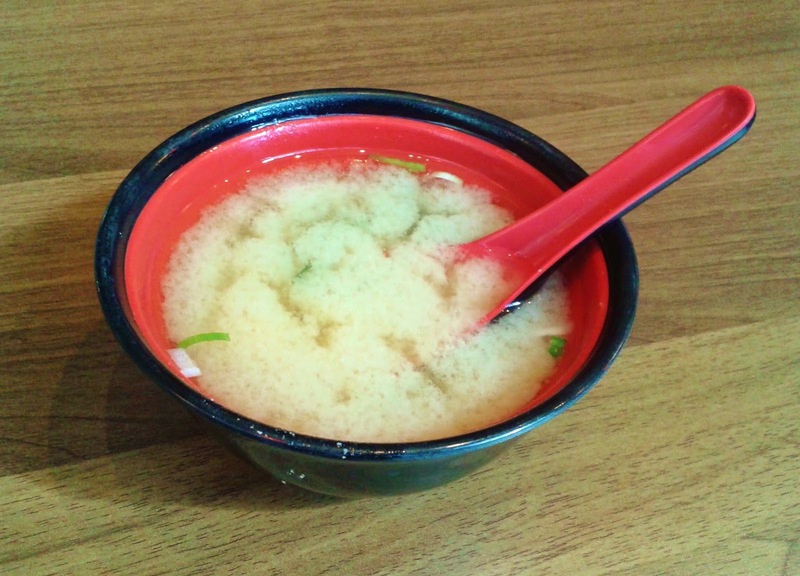 From 11 a.m. to 4 p.m., they have a Lunch Special which allows you to choose any 3 items (from a list of 36 items) plus miso soup for $8.95. What I like about this Lunch Special is that there is sufficient variety among the choices and the lunch special represents significant savings compared to ordering the items individually. Interestingly, I also noticed on the menu that they have written the word "imitation" in front of every instance of the words "Shark Fin" on the menu (this was a response to criticism on both Yelp and Urbanspoon). I guess the prices alone were not enough of a hint to some that the shark fin was fake. 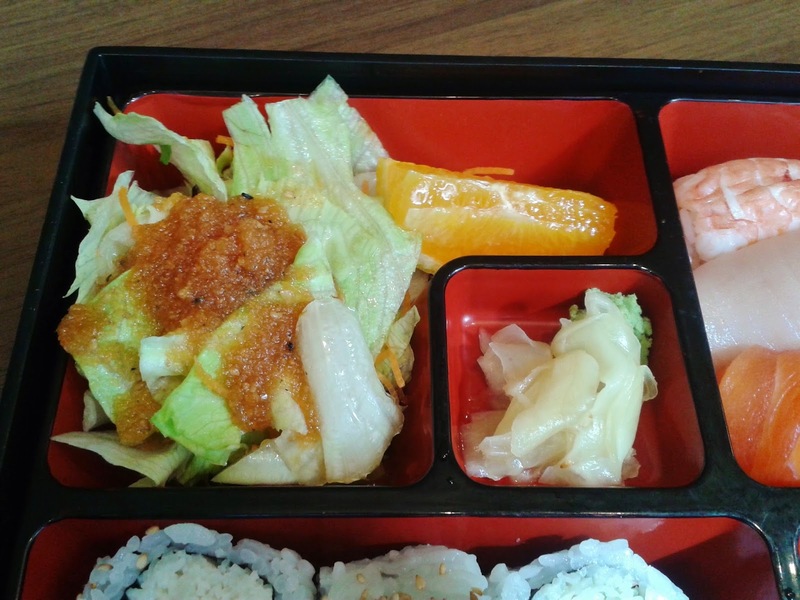 On the first day of my Sushi-a-thon, I constructed my own Lunch Special with the Small Chicken Teriyaki Don, the Tai Nigiri and the Appetizer Tempura. 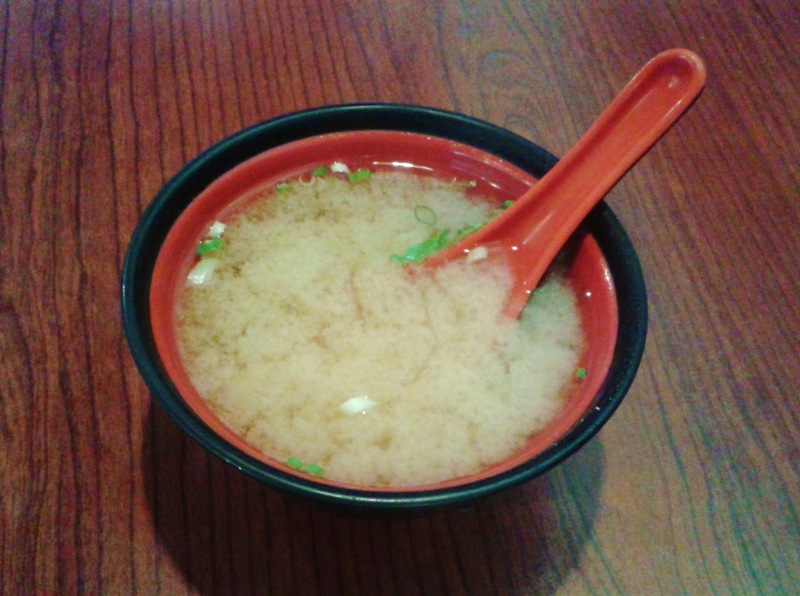 The Miso Soup had finely chopped green onions and small pieces of tofu. 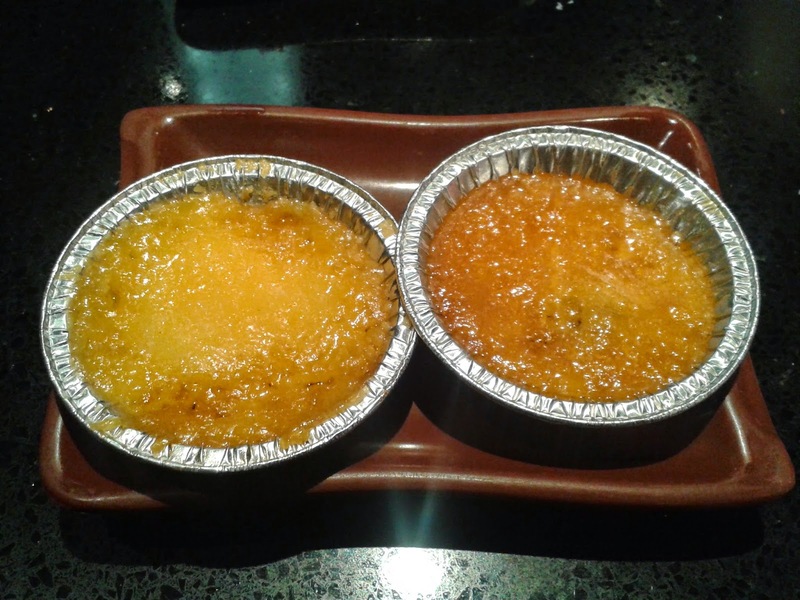 It was served at a steaming hot temperature (be careful!). It was a bit on the watery side and could use a little less salt. 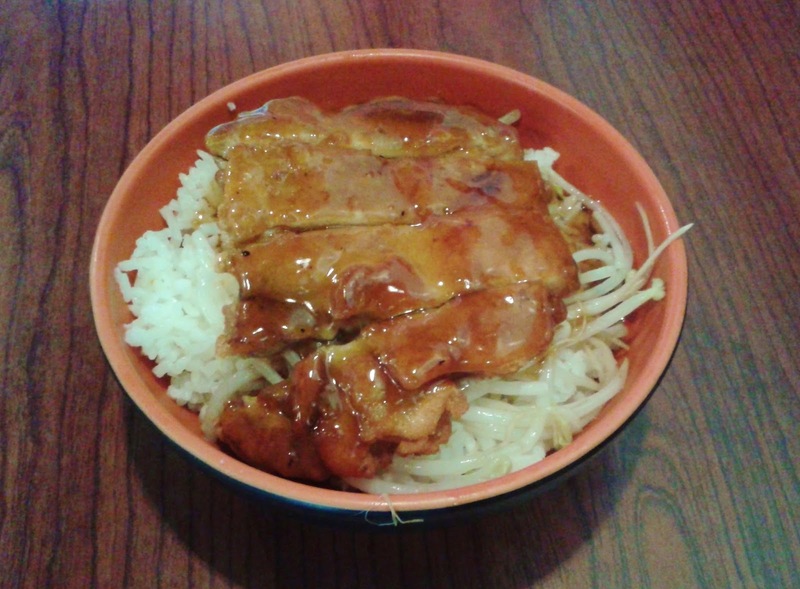 The Small Chicken Teriyaki Don was pretty standard fare. 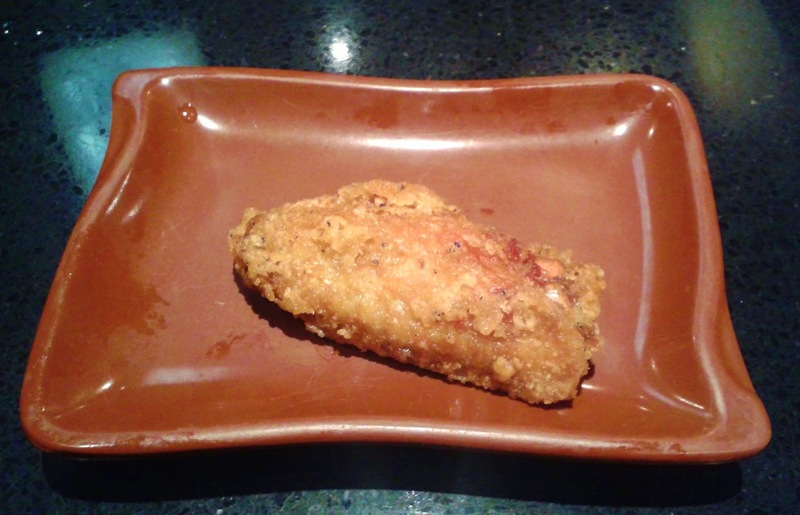 It contained 4 pieces of pan-fried chicken with the characteristic crispy skin on top. I enjoyed the crispy skin, but I would have liked more of the chicken (the balance was a little off). The rice also needed more sauce, though I suppose if you flipped the chicken over and smothered the sauce, you would get a partially satisfying result. The Tai Nigiri came with 3 pieces and the tai actually had a mild, sweet, fish-like taste to it (in so many other places, the tai is very bland). It was fresh and had a smooth texture while being a bit chewy. The sushi rice had a hint of vinegar (which was just right in my opinion) and was packed correctly, not too tight or too loose. I mean, seriously?! 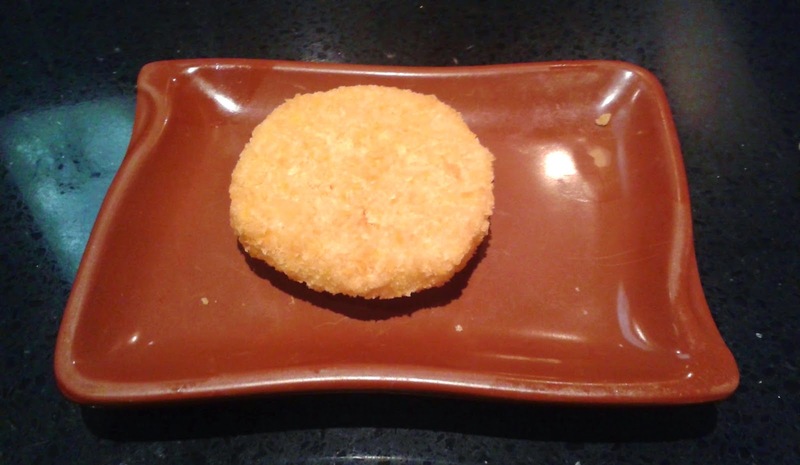 I award this the gold medal for "Most Batter Used for a Single Piece of Prawn." 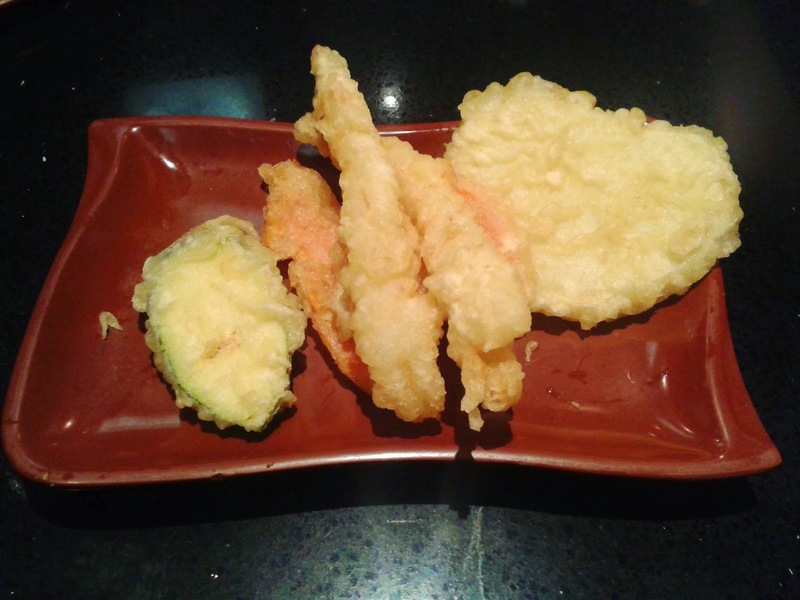 Fortunately, most of the tempura batter was detachable, though in the end, I had peeled off enough batter to make a separate, totally legitimate appetizer consisting of just the extra batter. The sweet potato tempura was the only piece to have the right amount of batter, but unfortunately, one side of it was burnt. The prawns were tasty and sufficiently meaty. If it weren't for the batter issues, the prawns would have been an A in my books. 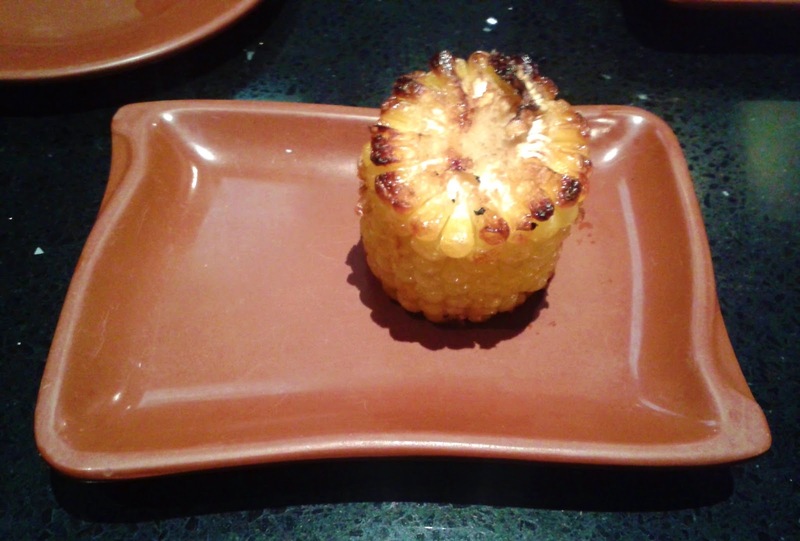 The kabocha (pumpkin) was thin but sweet, though it tasted a bit mashed. The zucchini was nice and juicy and was the best of the lot. 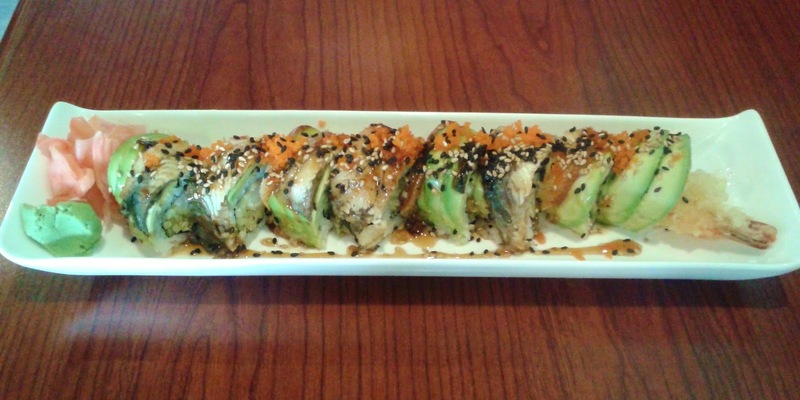 The Dynamite Dragon Roll consisted of 2 pieces of shrimp tempura with avocado and eel on top. 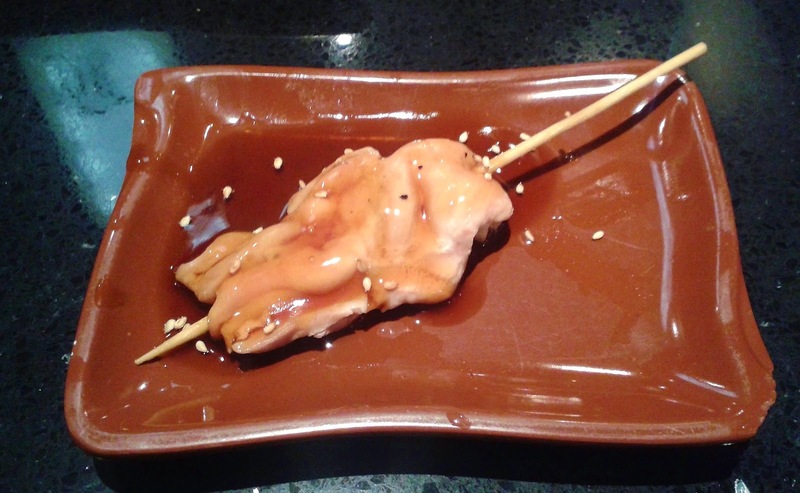 They were quite generous with the eel, which was smooth and garnished with ample sweet teriyaki sauce. 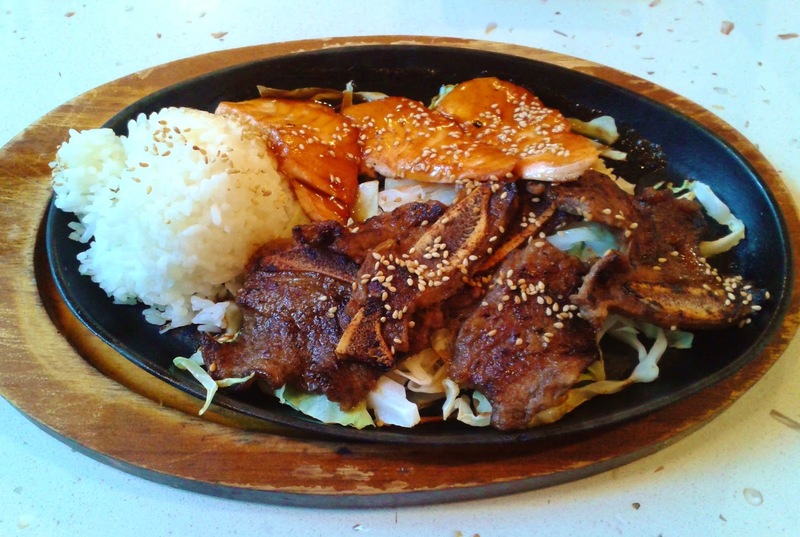 To give it more of a punch, they could have grilled the eel a little more to bring out a more smoky flavour. The interior of the roll was quite crunchy due to the copious amount of batter used. 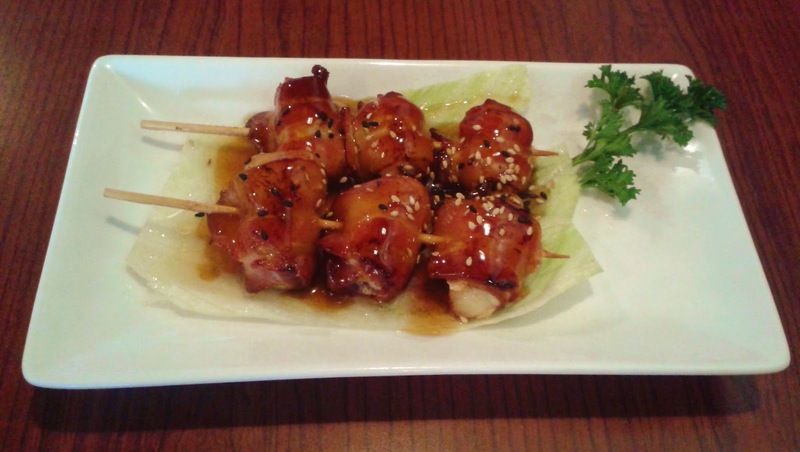 On the second day of my Sushi-a-thon, I ordered the Bacon Scallop Skewers (erroneously listed as "Scallop Skewers" on the dine-in menu) and the Deluxe Combo ($11.95). Surprisingly, the Bacon Scallop Skewers came before anything else. The Bacon Scallop Skewers came with 6 pieces of scallop, each having a bacon strip rolled around it. The bacon was slightly crispy and was savoury, and could have just a bit more of a smoky flavour to bring it closer to perfection. 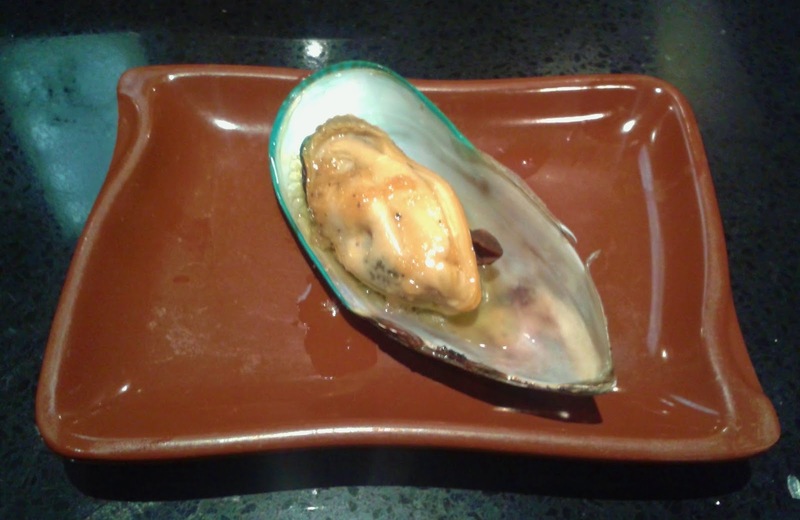 The scallop, though meaty, didn't contribute much in terms of taste. 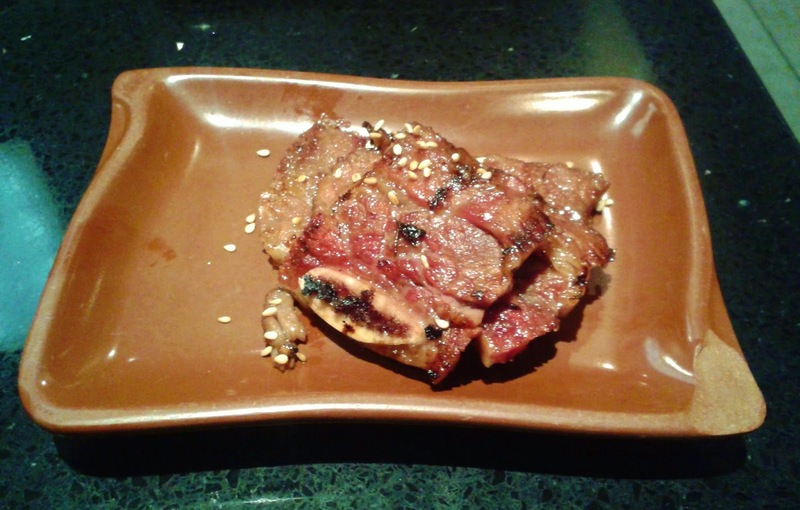 The teriyaki sauce was excessively diluted with oil, but there was lots of it and it harmonized well with the bacon. The Deluxe Combo came a few minutes after the Bacon Scallop Skewers and the presentation was neat and very colourful. Banzai! With the Masago Nigiri, I could feel the individual fish roe which made a nice popping sound. It had a distinct, slightly salty flavour to it. 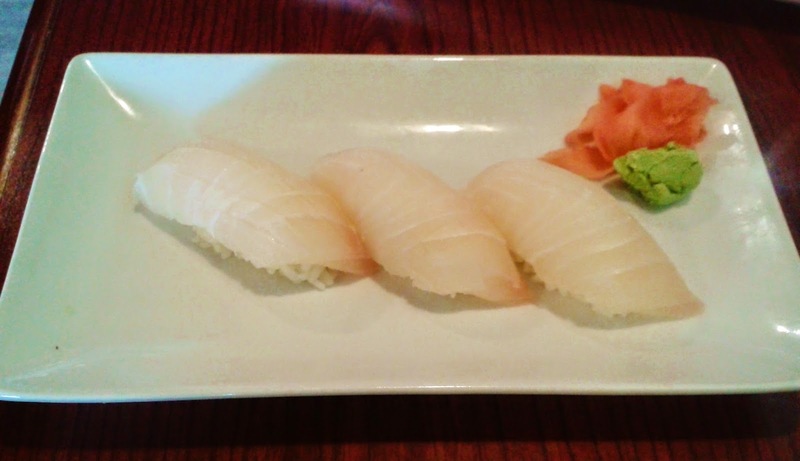 The Toro Nigiri was soft, smooth, and had a welcoming burst of flavour with neither a fishy nor metallic taste. The Tako Nigiri was sliced rather thick so I spent an entire minute trying to disassemble it with my teeth. The Unagi Nigiri was unfortunately split into two pieces held together by the seaweed, but it had a mild, sweet taste with a soft texture that matched well with the sushi rice. 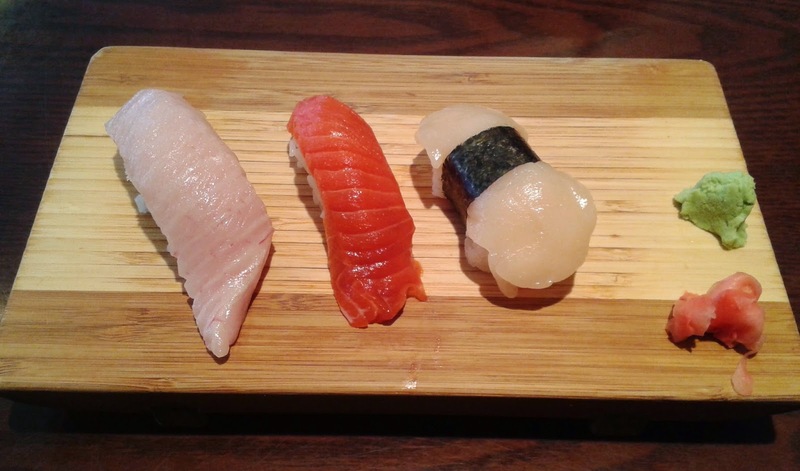 The Salmon Nigiri was very soft and had a bit of a shrimp-like snap to it. The Tuna Nigiri had a nice, smooth texture and was melt-in-your-mouth but the rice had more taste than the tuna. The Ebi Nigiri had the right amount of rice under it and tasted just like a fresh, well-prepared shrimp from a shrimp ring. 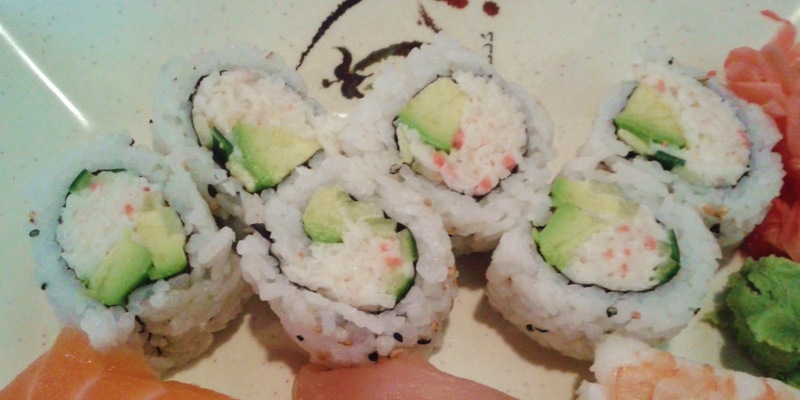 The California Roll came with 6 pieces consisting of crab meat, avocado and cucumber. 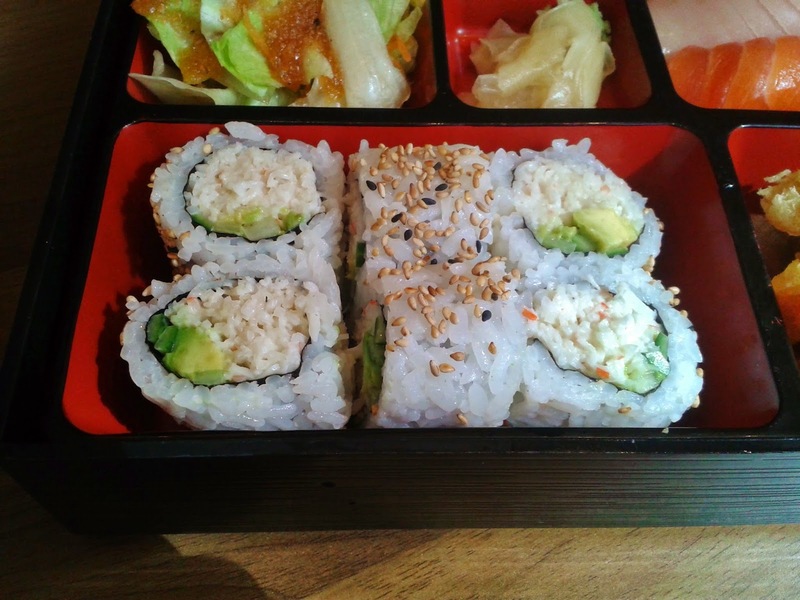 I liked the sesame seeds on top which provided another dimension of flavour to the roll. The crab meat was sweet but was a bit high on the mayonnaise. The sushi chef used a little too much force when rolling the sushi together. 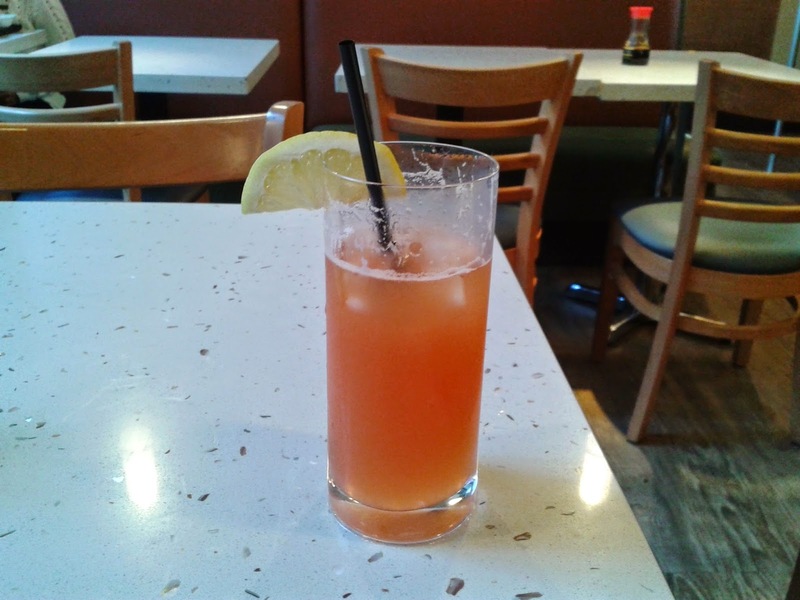 I discovered Sushi Town on Hastings as an inexpensive, decent alternative to SFU campus food 3 years ago and since then, I have been there so many times I lost count. It is a very popular restaurant which regularly experiences wait times (despite its rather odd location and run-down appearance from the outside) and is especially frequented by SFU students. On the other hand, they have enough chefs working at the sushi bar so that everything comes out in a minimal amount of time. The portions are quite large and it turns out that I still needed to make 2 visits (on Monday and Wednesday) after all to have enough to write about. Declan recommended this dish to me and it was a great way to sample several of the different kinds of raw seafood available. This item is listed on the menu in a somewhat confusing way - the name is too long to fit on one line, so it is printed on two lines with an extra line in the middle, making it look like two separate items. This Chirashi Don is enormous and comes with tuna, salmon, ika (squid), ebi (shrimp), hokkigai (surf clam), tai (red snapper), tamago (egg) and vegetables. Usually, the spicy sauce is mixed in with the ingredients but I had it separated and placed on the side in case it was too spicy for me to handle. The tai (B-) was lacking in flavour, but was sliced into thin pieces which made it easier to chew. 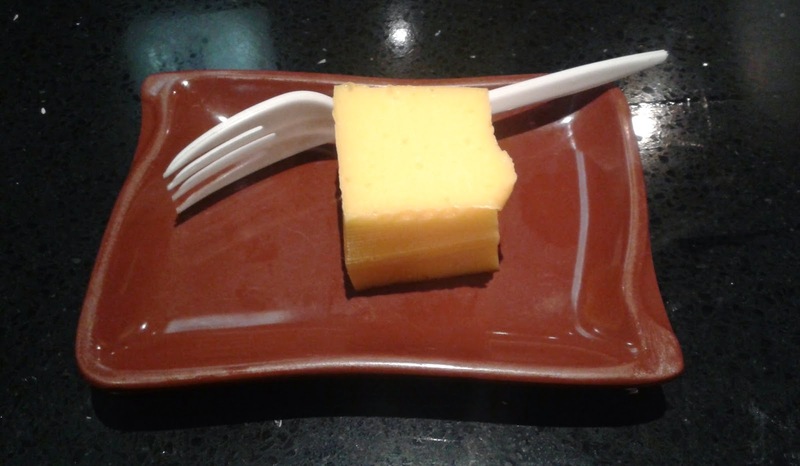 The tamago (B) had a strong egg flavour. I would have enjoyed it more if it had more sweetness to it and was softer. The salmon (A) came in abundance and was fresh and tasty. The tuna (B) tasted too salty and was a bit tough. 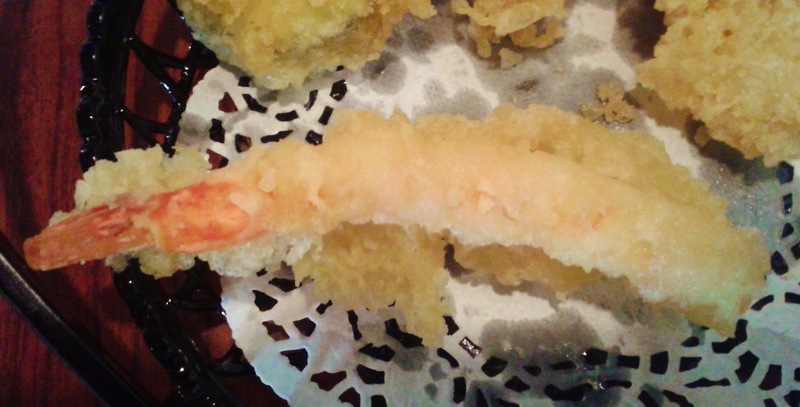 The ebi (B) was also tough but was sweet with a slight gingery taste. The ika (A-) was mild in taste and had a desirable level of chewiness. 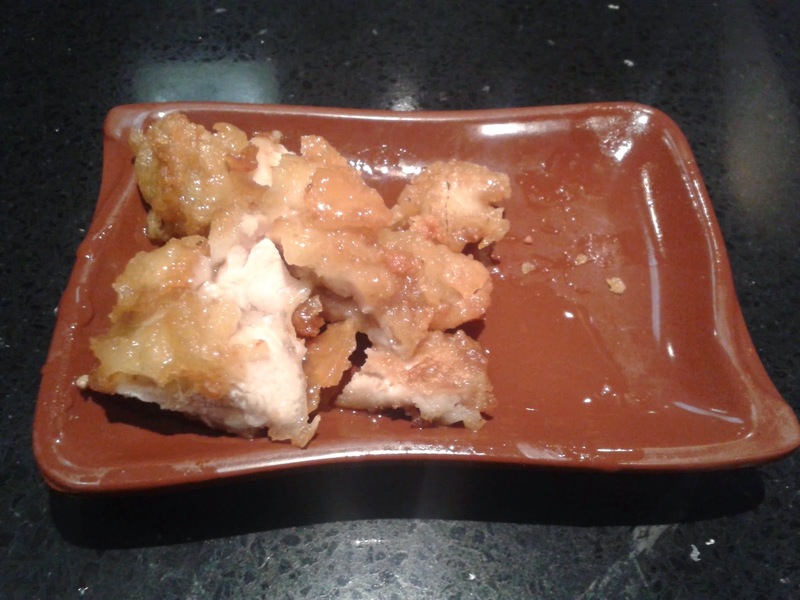 The hokkigai (A-) was sliced very thin, but despite this, it still packed adequate flavour. I enjoyed the sushi rice at the bottom which was well-seasoned, and the seaweed and masago added to the dish also helped enhance the flavours. I had a small spoonful of the spicy sauce (which was like kimchi sauce) and it would have been too spicy for me to handle if all of it was mixed in. There was also too much lettuce for the both of us to handle, but if you're looking for a filling dish, I guess this is a good thing. 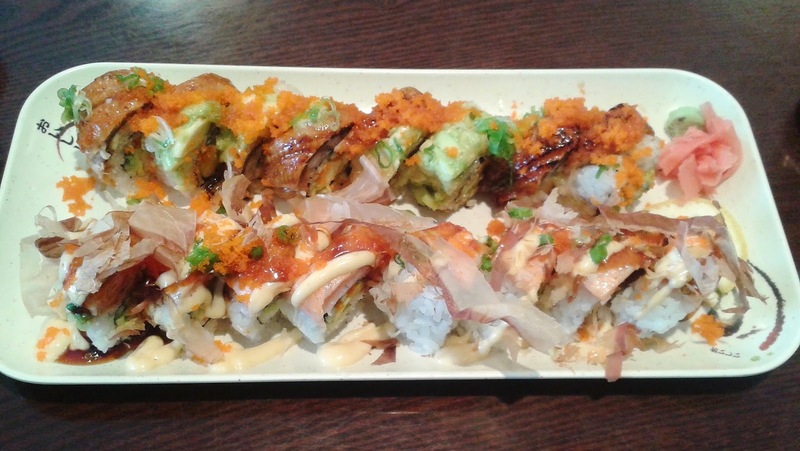 The Double Dragon Roll consists of avocado, cucumber, masago, unagi and mayonnaise. The interior of the roll was dominated by the avocado, which resulted in a sweet, creamy and soft interior. This was well-balanced with the generous portions of unagi on the outside. The unagi was savoury but had a few bony parts (not to the extent that it was a major issue). 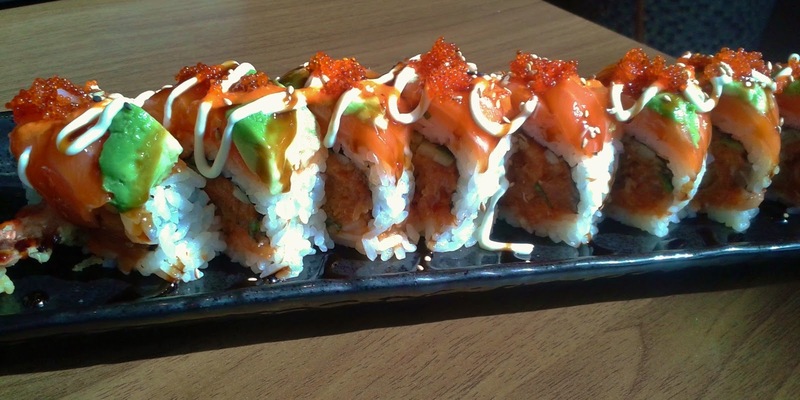 The Awesome Roll is widely considered their best roll and consists of crab meat, cucumber, avocado, mayonnaise, masago, salmon, green onion and bonito flakes. There was a rather heavy use of sauce with this roll, but the mayonnaise and teriyaki sauce together blended harmoniously and was especially tasty when supporting the bonito flakes. 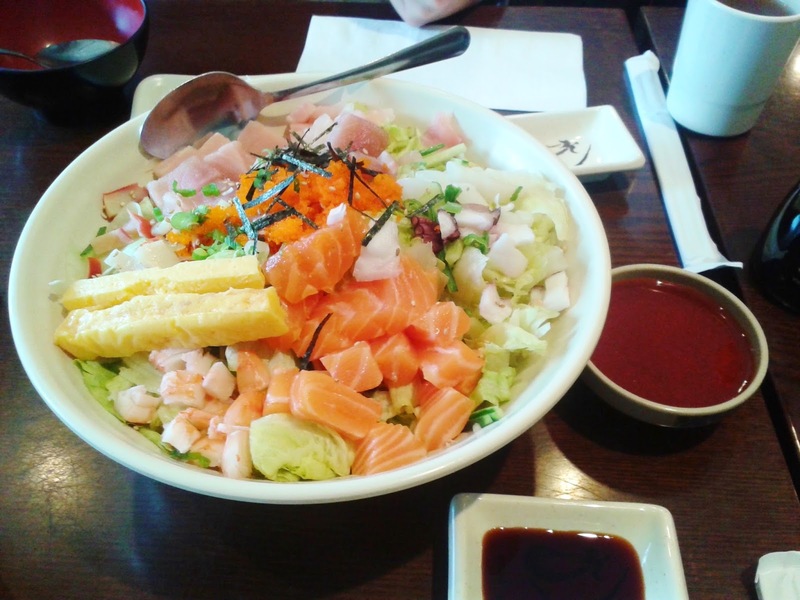 The crab meat was sufficiently soft and the salmon on top was slightly cooked but still mostly retained the smooth texture of raw salmon. By this time, I was full enough to call it a day, even though it was only lunchtime. 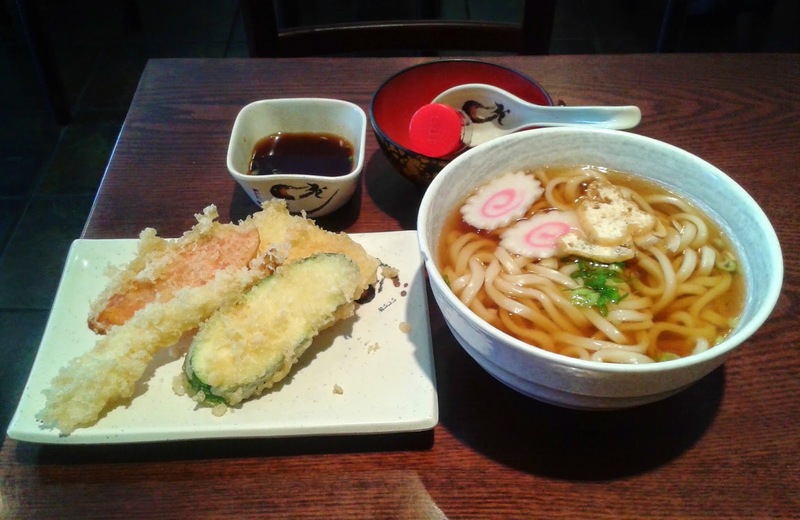 The Tempura Udon ($5.95) comes with 4 pieces of tempura (zucchini, carrot, prawn, yam) and a very generous bowl of udon. The tempura came with a gingery mild soy dipping sauce and was well executed other than there being a few bits of batter sticking out in places. 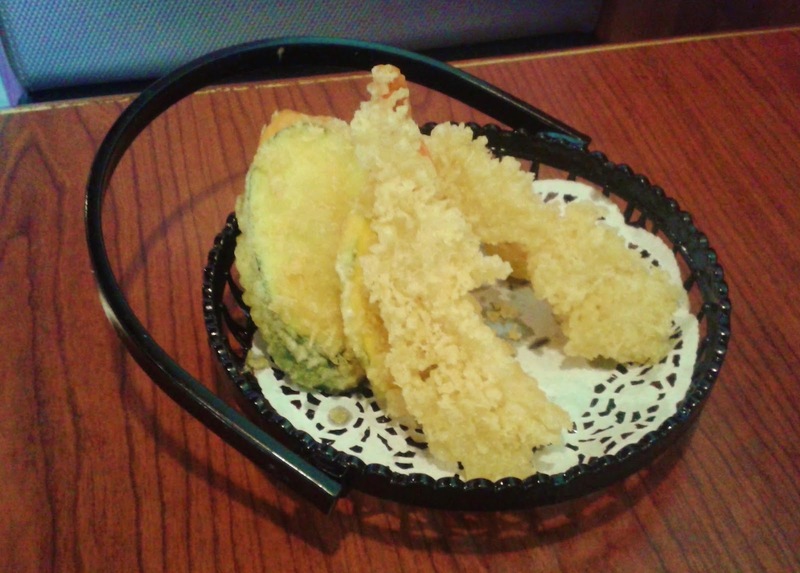 There was a good ratio of prawn to tempura and a successful attempt at preserving the juiciness of the zucchini. The carrot was sweet, but the yam was cut abnormally thick (probably by accident as this was the first time this happened to me). The udon noodles had just the right chewiness and the soup was simple but well-balanced. 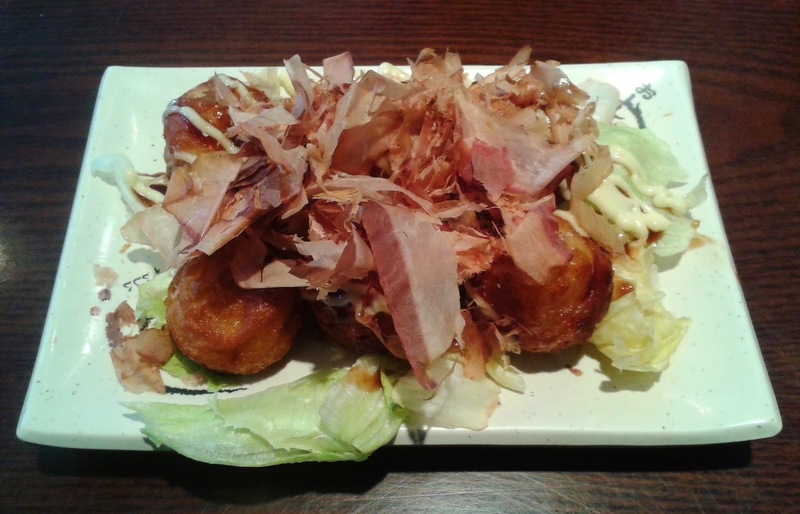 The Tako Yaki was presented with a thin, crunchy exterior layer encasing a soft, pillowy flour layer on the inside. The tako (octopus) was prominent, chewy and provided good contrast with the rest of the Tako Yaki. The bonito flakes could have been cut and placed more neatly as it looked a lot like what you would see inside a pencil sharpener. Other than the toro nigiri mishap, the rest of the food met my expectations. Service is adequate during less busy hours but may seem a bit rushed during "rush hour". 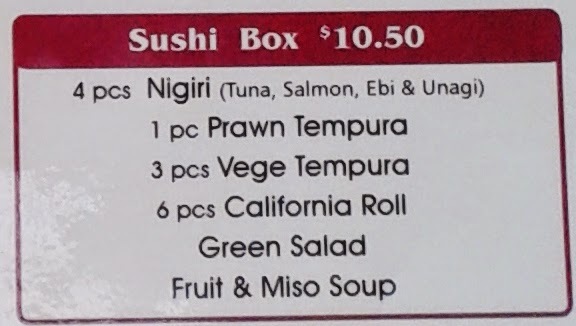 There is a good assortment of items on the menu at bargain prices, but I wish they expanded their selection of special rolls as the existing ones are all quite popular. If you only have twenty dollars in your pocket, you can walk into Sushi Town, have a fulfilling meal, and walk out with half of your money left.